Yes! In the Startup and Venture Capital world, unicorns exist. Companies that are valued at $1 Billion or more are called Unicorns. Sometimes these mythical creatures are exactly that, mythical, as their future traction never lives up to support their current $1 Billion+ valuations, while others continue to grow and successfully exit at valuations in excess of $1 Billion. On paper, these companies are worth $1 Billion+, but these are only private company valuations based on last financings, such as raising $200 Million at a $1 Billion valuation (where a startup gives a 20% equity ownership stake to investors). However in the event of an acquisition or IPO the valuation may be different, as the valuation methodology of acquirers or public markets are often weighted more towards comparable company revenue or EBITDA multiples vs. financing valuations that are often more weighted towards an investor's target ownership amount. 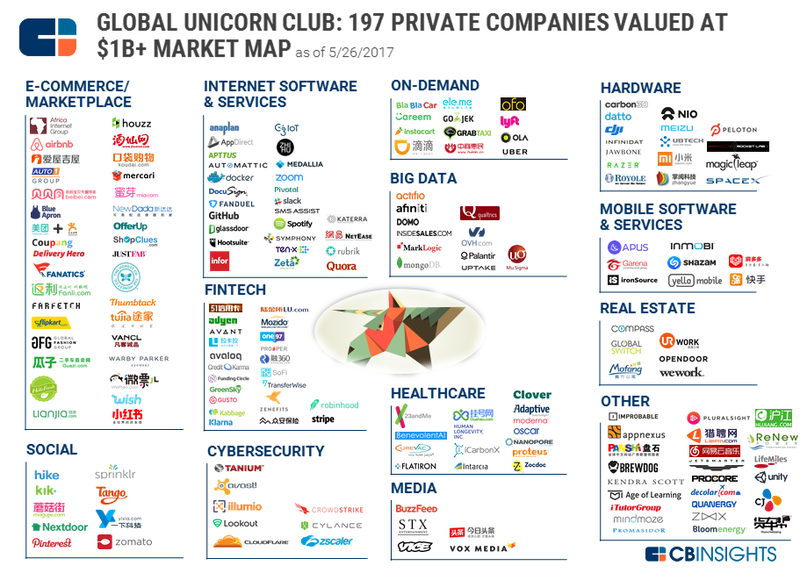 As of May 2017, CB Insights tracked 197 unicorns globally (Private companies valued at $1B+). See Info Graphic. If I attend Venture University, will I be able to invest in a "Unicorn" or "The Next Big Thing"? Such as the next Facebook, Amazon, Uber, AirBnb, Google, etc.? We hope so! That's the plan! As a team, you'll be sourcing investment opportunities from the seed stage to the growth stage, which range in risk and potential financial returns. You will have to decide whether to pass or make each investment, and see if you believe it has the potential to become or already is a worthy "unicorn" or "The Next Big Thing" in its industry. Getting into the best investment opportunities isn't easy and takes hard work. When you make a seed or VC investment you often don't know if it will become a huge success until years later, or you can choose to invest in growth stage companies with more traction that have a lower risk level, but also have a lower financial return potential and a shorter time horizon for an acquisition or IPO to happen. I don't have a big network within the startup and investment world, how will I deal source great investment opportunities during the Apprenticeship Program? Venture University trains individuals in the VC/PE Investment Apprenticeship Program on how to network and deal source within the startup and VC world. Venture University will also open the doors for you by introducing you to a number of startup accelerators and ecosystems, angels, seed, venture, and private equity investors, where you can review their portfolio companies and share deal flow. Beyond the deal flow sourced by individuals in the VC/PE Investment Apprenticeship Program, Venture University's network of investors, advisors, startup founders, etc. will also share top deal flow to be reviewed. Why was Venture University created? Venture University was created to make better investors and entrepreneurs. The founder's of Venture University believe that education has to be disrupted and provide greater value for the cost of tuition. Often students graduate from college and/or graduate school and feel that the majority of the value came from the internships and work experience they got than the academics taught to them during the semesters. Venture University is innovating what a university is and better aligning the goals and incentives of its students with its curriculum by being a trade school that offers both an Academic Program and a Apprenticeship Program with more benefits and potential upside than what a traditional university program offers. Venture University was created to offer individuals the opportunity to "learn by doing" in an immersive format, to provide a valuable experience with tangible skills, and increase their ability to get or create the job of their dreams. Is Venture University an actual university? What is an "actual university"? We believe we are re-defining what a university should be in order to better serve its students and alumni. Traditional schools provide academic degrees such as BS's, BA's, MS's, MBA's, JD's, etc. Venture University provides GRSDs, which stands for "Getting Real Stuff Done". GRSD is more valuable than paper certificates and is valued much higher by employers. At Venture University individuals spend ~20% of their time doing the Academic Program and ~80% of their time doing the VC/PE Investment Apprenticeship Program where they "learn by doing" on Venture University's investment team. Venture University is the "Ivy League" for angel investing, venture capital, and private equity, with an acceptance rate of <2%, making it more competitive to get into than an Ivy League school, the Ivy equivalents (MIT, Stanford, etc. ), and top MBA programs. Venture University is in a league of its own, with less of a focus on sports, and more on cash flows. I'm not an accredited investor, can I still participate in Venture University's VC/PE Investment Apprenticeship Program & Receive The Profit Sharing Agreement? A) What Is An Accredited Investor? If you don't know what an accredited investor is, see graphic to the left. In the United States you have to meet one of these three criteria in order to invest directly in a private company or an investment fund that invests in private companies. There is some wiggle room on investing in equity crowdfunding platforms, but there is a cap on how much you can invest. B) Profit Sharing Agreement: Individuals in Venture University's VC/PE Investment Apprenticeship Program receive a Profit Sharing Agreement tied to the future performance of the portfolio companies invested in during their program. * Individuals do not need to be an accredited investor to receive the profit sharing agreement with Venture University. Individuals who participate in Venture University's VC/PE Investment Apprenticeship Program do not receive an equity stake in Venture University's investment fund or an equity stake in the portfolio companies. C) Accredited Investors: Individuals that are accredited investors, whether they participate in Venture University's Apprenticeship Program or not, are welcome to invest in Venture University's investment fund and in a portfolio company through Venture University's investment fund given availability in the investment round. Individuals that are not accredited investors are not able to invest in Venture University's investment fund or in a portfolio company through Venture University's investment fund. Can I invest directly in Venture University's investment fund and/or co-invest in the portfolio companies? Yes, if you're an accredited investor! What happens if during the Apprenticeship Program no investments are made or if not all of the capital allocated for investment gets invested in portfolio companies? Can I get my money back? No investments are guaranteed or required to be made during the program period. All investment teams source potential investment opportunities, conduct due diligence, and then individuals participate on investment committees to invest in ~3-6 companies and discuss how to best invest some or all of the capital allocated during the program period. It's the investment groups job to hustle and make investments. If no investments are made or if 100% of the Apprenticeship Program Capital allocated is not invested or committed to be invested by the end of the program, the capital rolls over to the following Apprenticeship Program semester to be invested in future portfolio companies, and you and your fellow team members will still share in the same financial upside economics. Sometimes going through the investment process and choosing not to invest in a company is also a useful skill, and knowing when to pass is just as important as knowing when to invest. While we believe it is unlikely scenario an investment team will not find a single worthwhile investment to make, if it does happen, the capital will be rolled over to the next Apprenticeship Program semester to provide additional capital to be invested, and your cohort will still benefit from the future financial upside after that capital is deployed and invested in portfolio companies. How much college credit do I get from attending and does my college / university accept college credit from Venture University? Students may be able to receive college credit for the Apprenticeship Program if they attend and successfully complete Venture University's program and their college and/or university accepts the college credit for the Apprenticeship Program as internship credit. A student's college or university is not obligated to accept the college credit for any program, or accept a specified amount of college credit from any program. It is the responsibility of students to check to see if their college or university will accept the college credit for the Apprenticeship Program and how much credit will be accepted from participating in Venture University's program. The VC/PE Investment Apprenticeship Program is designed to be the equivalent of an internship where the individual participates 5 days per week during a semester. Depending on a college and/or university's policy on accepting college credits for internship experiences, this may be equivalent to 4-8 college credits. Venture University is not an accredited university or college, and can not currently offer college credit for the academic program. We may choose to pursue the ability to offer academic college credit in the future to individuals that participate in the program, however given the low level of demand for academic college credit from individuals applying to the program this is a currently a low priority for Venture University. Am I guaranteed a job after doing Venture University's program? Is Venture University a job placement program? What's the likelihood I'll get a job in VC/PE after Venture University? Venture University does not guarantee an individual will receive a job offer during or after doing Venture University's program. Venture University is not a job placement program. Venture University is a professional development program. While participating in Venture University's program you will be placed on Venture University's investment team as an apprentice and gain investment experience. It's unknown what the probability is that you will get a VC/PE job offer during or after completing Venture University's program. Having quality VC/PE investment experience and a strong VC/PE/startup network is rare, and is likely to improve your odds of getting noticed and selected during the initial filter / screening process for potential candidates to interview at investment funds. Once you land the interview, it's more about personal fit with the personalities and culture of the team. What does Venture University do to support my career development? How does Venture University's help me get a job in VC/PE? Venture University offers individuals in the VC/PE Investment Apprenticeship Program a multi-faceted strategy for career development and increasing their odds of getting a VC/PE job. 1) Resume & LinkedIn Profile Updating: Venture University provides core bullets you can use in your resume and on LinkedIn. During the VC/PE Investment Apprenticeship Program all individuals will have their resumes and LinkedIn profiles reviewed and updated. Getting your foot in the VC/PE door is the hardest part. Individuals that do the Apprenticeship Program are taking their first step into the VC/PE door and begin their journey of gaining quality VC/PE investment experience. 2) Career Development Meetings: Individuals that participate in the VC/PE Investment Apprenticeship Program are offered three career development meetings, which happen at the beginning, in the middle, and at the end of the program to discuss an individual's career goals, personal strategy, and execution plan. During the VC/PE Investment Apprenticeship Program, individuals will meet with VC/PE investors weekly to share deal flow and potentially co-invest together. By building a relationship from the same side of the table, it's more likely you'll be considered for future job opportunities by those within your network. This is the preferred method for building VC/PE relationships and getting a job in the industry, rather than reaching out to investors for the first time to ask them about working at their company. Increase your network of investors by attending Venture University speaker series, modules, and attending VC/PE networking events during and after the program. Venture University hosts VC/PE investor only events for investors in the industry to meet with current VU cohort members and VU alumni. Alumni Network: Individuals in each cohort are angel investors, family offices, new fund managers, and individuals who are working at or recruiting to join investment funds. Three times a year Venture University does an event introducing the incoming cohort members to all of Venture University's alumni. 4) Get Access To Venture University Job Posts: Venture University has a proprietary curation of VC/PE job opportunities it shares with the current cohort and alumni, which include both public and non-public VC/PE and startup job opportunities. 5) Direct Recruitment: VC and PE funds reach out to Venture University throughout the year to do direct recruiting from Venture University's cohorts and alumni. 6) Become A Venture Fellow / Venture Scout: After an individual finishes Venture University, they become a Venture Fellow / Venture Scout, where they continue to source deal flow, engage with investors, and support the portfolio companies. By continuing on as a Venture Fellow / Venture Scout at Venture University an individual's foot is always left in the VC/PE door, and you're forever part of the VU family! Disclaimer: Individuals do not receive an equity stake in Venture University's investment fund or an equity stake in any of Venture University's portfolio companies by participating in Venture University programs. Individuals (not including foreign national) that participate in and complete the Investment Apprenticeship Program receive a profit sharing agreement that is tied to the future performance of the investments made during the program. If an individual that participates in the Investment Apprenticeship Program is an accredited investor, then at Venture University's sole discretion, the individual may be allowed to, but is not required nor have any obligation, to invest in Venture University's investment fund or a portfolio company through Venture University's investment fund. There is no guarantee of any return of capital or profits from the investments made, as the risks of investing are high, the future outcomes from the investments are unknown, and could result in a 100% loss of invested capital in the portfolio companies, or result in a small or significant amount of profits for individuals in the Investment Apprenticeship Program which will be recognized as income and be taxable. *Foreign nationals are not able to receive the profit sharing agreement.